Head-Smashed-In Buffalo Jump bears witness to a communal hunting technique practiced by native people of the North American plains for nearly 6000 years. They killed buffalo by driving them off the 11 metre high sandstone cliff, close to a natural grazing area of the buffalo. The sheer weight of the herd pressing from behind would force the buffalo over the cliff. This custom continued into the late 19th century and still forms part of the 'traditional knowledge base' of the Plains nations. After falling off the cliff, the buffalo carcasses were processed at a nearby camp. The camp at the foot of the cliffs provided the people with everything they needed to process a buffalo carcass, including fresh water. The majority of the buffalo carcass was used for a variety of purposes, from tools made from the bone, to the hide used to make dwellings and clothing. Deep layers of bison bones are still buried below the cliff. Also, remains of marked trails and an aboriginal camp can still be found. What we want from WHS is unique sights, experiences or stories. Head-Smashed-In Buffalo Jump clearly fits that bill. The site represents the story of a communal hunting technique that is only found in this region. The way this hunt was executed is explained well at the 15 minute introduction video at the on site museum. It was a yearly event, during the fall, to get enough food for the clan to last through the winter. It pre-dates the arrival of horses and guns, two items which enabled the people to hunt bison more easily. The museum is built into the cliff where the jump took place. You walk up via five levels of exhibitions about the landscape, the hunting and the people to the plateau. At the top there's a fine prairie trail that leads to the cliff edge. 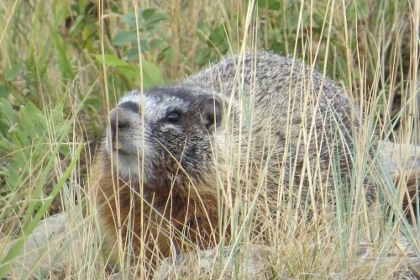 I encountered a hoary marmot (first "new" mammal of the trip!) that sat by the side of the path. Without the story, the cliff itself is not too interesting. I also thought that the museum could be done better - it's a bit oldfashioned with a lot of textual displays and relatively few items that most are replicas. I wonder about all these replicas such as the hide with the 'winter count': has nothing survived the ages, or are the originals in different museums around the world? After I had seen the museum I walked the lower trail, another nice short hike of about 45 minutes that takes you to the site where the bison that had jumped landed. Not that there is a visible grave of bones or something: the layers of bone deposits are meters thick below the current ground. Prairie grass and some bushes have taken over the landscape again. Entrance to the site costs 11 Canadian dollar. It attracts a steady flow of visitors, as it is within reach of a day trip from Calgary. A visit can also be easily combined with that to another WHS, Waterton Nation Park, which lies about 1.5 hours south. Head-Smashed-In Buffalo Jump is an excellent site to visit if you are interested in Pre-Colombian America. If you take the route from Lethbridge, you get to approach the cliffs from the Prairie, so mountain tops are visible as a backdrop. I went here in July after being chased out of Glacier National Park by a huge forest fire. This turned out to be for the best, because I was now able to visit on a Wednesday, which is when the Blackfoot Tribe puts on a drumming and dancing performance. The Visitor Center is very well done and I would highly recommend spending some time learning about how the jump was used for thousands of years. There is also a short video that gives a visualization of the hunting process. You can walk the top of the Jump to a viewing area, where you can see along the rest of the cliff. You can also take a walk along the bottom of the Jump to see an old tipi ring, the butchering site, and the place of impact. I really enjoyed visiting this Site, and would highly recommend a visit on a Wednesday. It was as a young man and I was standing at the World Heritage listed Head Smashed in Buffalo Jump in North America. It is a site that celebrates the hunting culture of the Native Americans prior to the introduction of horses. Part of the cultural centre had a display that described where the native tribes lived over the centuries. What was fascinating was the sweep and swirl of the tribal movements. Initially it was slow, as they relied on foot transport. But then something amazing happened. There were surges and violently rearranging tribal arrangements as the introduction of horses revolutionised the Native American lifestyle. I was amazed at how such small changes have the power to fundamentally alter everything these people had known about life. It suggested that the "world" that we understand was not as real or as fixed as I might imagine. What do we believe to be a fundamental truth now that will be discarded tomorrow? not disappointed. The interpretive center was excellent with a film depicting how the jump had been used and it also had Native American artifacts on display; the view from the actual jump itself was beautiful. I found the site to be fascinating and would highly recommend it to anyone. While in Canada, I also visited the Remington Carriage Museum and Frank Slide both of which were also very well done. A pass was available at the carriage museum, and I feel certain that it would be availabe at the other two sites as well, that allowed each adult to visit all three sites for $20.00 which is a savings of $7.00 each. Our family visited about seven years ago and it was very impressive. Driving to the site, we could not believe how well it is blended into the landscape. We could not see the visitors center till we were at the entrance. It is beautifully blended into the environment and preserves the wild look of the area. The many exhibits were interesting and informative. Our boys learned a lot. We have been to Cahokia Mounds the World Heritage Site near our home. Head Smashed is just as wonderful as the mounds. We hope to return again. I definitely would recommend it. 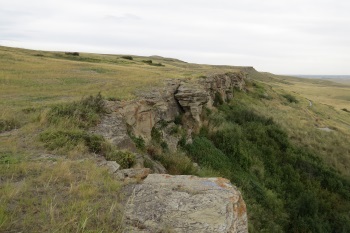 a buffalo jump is a cliff, that the natives of alberta used to kill buffalo. the natives would force the buffalo into jumping off the cliff, thus killing themselves. head smashed in buffalo jump is the bes tpreserved buffalo jump in the world; many others have been looted or mined. the jump has a first rate museum, which very informativly tells you about, not only the buffalo jump, but the native way of life. the cliff, itself, is not very spectacular; but you get a very good view over the surrounding country side fro mthe top. there are two trails, the cliff top trail, and the bottom of the cliff trail. in my opinion the bottom trail is better, as you get to see, not only the main jump, but you also get a very good view of the secondary jumps. overall, head smashed in buffalo jump is an excellent day trip, a you will very likely have never seen anything like this before. 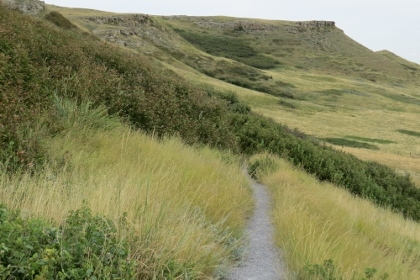 The Head-Smashed-In Buffalo Jump site could be one of my favourite sites in Canada. It is impressive even when you approach the entrance by car, with tipis set up for tipi camping on the left (this was in mid-June) and on the right, the Interpretive Centre, which is built on the side of the hills. Even the red sign that greets you at the entrance is cheerful. The World Heritage site plaque is located at the front of the building. We were lucky to receive free admission into the centre because we had filled out a survey for Parks Canada the day before at the Field Station at Dinosaur Provincial Park. It is worth your time to fill out this survey, as it saved us $18.00. The Interpretive Centre was not only thoughtful about the architecture but also the presentation of exhibits and the introductory film, which was a good introduction of the traditional bison hunt. The centre is meant to be viewed starting from the top floor and working your way down each floor. On each floor, the creation story of Napi is told. Once outside to view the actual precipice, we needed to wear our jackets to protect us from the windy conditions so be prepared with warm clothing and layers. The path to view the site is also wheelchair accessible. It is also worth your time to go for a hike along the Lower Trail outside of the centre. 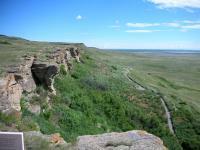 Here you will discover an exposed escarpment and other interesting facets about the prairie environment. It's a great place to learn about the way they brutally, slowly and painfully killed the poor defenceless buffalo. Thanks guy's! Head-Smashed-In Buffalo jump is a great place to visit. 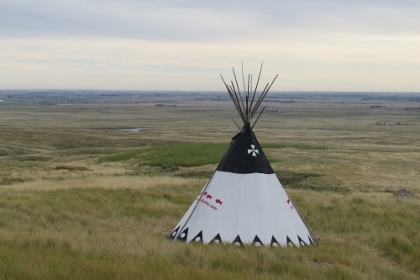 This site provides the opportunity to take an interactive pituresque trip through the history of the Plains Indians from before the White settlers came to present day life. I found this center was an excellent way of showing and explaining to my son the plight the Plains Indians faced and why First Nations people have many present day issues. I enjoyed my day trip so much that I have gone back and given the opportunity would go back again. From "Head-Smashed-In Buffalo Jump Complex" to "Head-Smashed-In Buffalo Jump"
Fly into Calgary Airport, and then drive south along Highway 2 for 180km. The site is close to the town of Fort MacLeod and well-signposted. Purpose Built Visitor Centre: In core zone. 1987. Leblond and tnrs. Legends and Folk Myths: About a young Blackfoot found with his skull crushed by the weight of the buffalo.